What’s so bad about big breweries? Do they not offer consumers a wide range of products, from premium brews to cheapswill? On paper, the consumer wins. So are complaints by independent brewers just much ado about nothing? After all, if the beer tastes good, why should the consumer care at all? Independent Brewers associations across the USA, Ireland and Australia do think that customers care. Small brewers can now choose to carry new ‘independent craft‘ badge on labels, meaning they are produced in small volumes, independent with only a small percentage owned by big beer, and doesn’t produce alcopops / flavoured malt beverages. Outlier Cartel (along with several other independent breweries) have taken a staunch stand in asking that the NZ Brewers Guild *only* include independent brewers on its board. The NZ board currently has 2 chairs led by Mitsubishi-Kirin (via Lion) and Heineken (via DB). So are we smaller breweries doing this out of envy of big business? Or are there deeper concerns? As Creature Comforts founder states: watch the hands, not the cards. Here are the reasons to be weary of big beer’s influence in New Zealand. 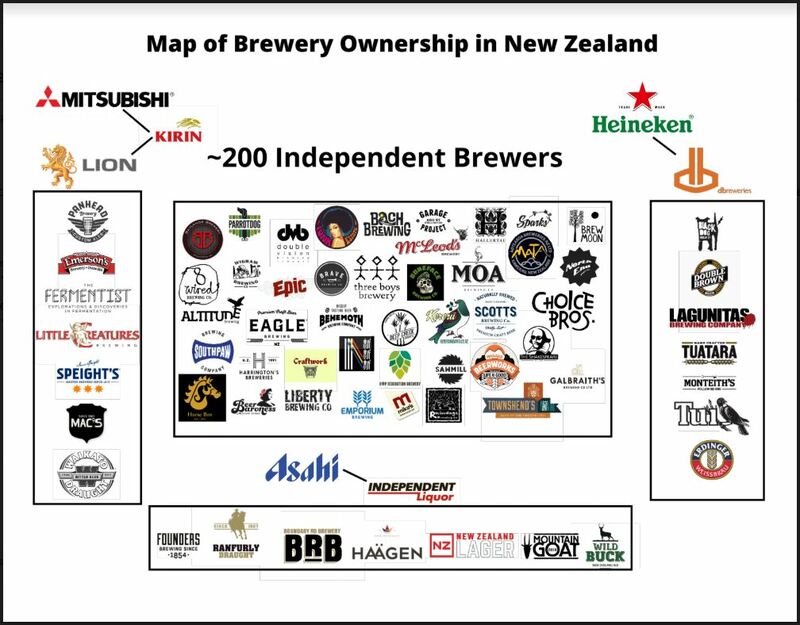 First its to important know that there are 20 breweries in New Zealand that are run by 3 international corporations: These include Mitsubishi (who own subsidiaries Kirin and Lion), Heineken (subsidiaries include DB), and Asahi (subsidiaries include Independent Liquor). Note for the purpose of clarity corporate breweries will be listed in their subsidiary hierarchy. There are over 200 independent breweries in New Zealand, which on the current NZ Beer wikipedia page are described as “numerous additional brands that operate at a semi-professional level and tend to come and go“. Sadly, semi-professional and transient is precisely the view that big beer has been marketing about craft beer upstarts. Its sad to see this on the one website where the world comes to learn about New Zealand beer. Misdirection is key for big brewers that have either bought or created ‘craft’ beer labels: “They portray these beers as if they come from small companies when in fact they come from very large companies“. In fact, as most marketers know, it benefits big brewers for consumers not knowing that their premium brands are not owned by an enormous conglomerate. Such is the unique position of craft beer; consumers love them for the fact they are small and independent; and in many cases – craft beer was started as a rebellion against generic, corporate beer. In some cases, the landgrab on craft beer reputation is almost comical, such as the case of Trouble Brewing – a corporate brainchild of Walmart, North American Breweries and WX Brands. In this case, Walmart was sued by a customer for misrepresenting craft beer – by the fact that Trouble Brewing does not actually exist as an operation! By contrast – when a craft brewery works with other companies, most will openly declare with whom they working. This transparency is purposely lost on industrial beers. Furthermore, there is a distinct clarity of who brews the beer. It is not unusual for brewers wanting to show the world they have worked together on a the beer, and these can easily be seen by looking up collaborations on Untappd, which show precisely who worked on the beer. Why does this matter to consumers if big breweries (often foreign owned) buy the little guys? In controlling resources – NZ has gone through a couple of hops shortages, and though details are murky, those with the most buying power can leverage these limited resources. Similarly, the common practice good will amongst smaller breweries worldwide in sharing access to hops and malts and other brewing materials will be severely limited. For those, who aren’t in the industry or are new the spirit of collaboration amongst brewers is both refreshing and astonishing; especially if you come from a background in the cut-throat corporate world. One method of controlling the resources, is buying out craft breweries. Its an intoxicating proposition for craft breweries to be bought as it gives them buying power they would have never had before, but what is the cost for the craft beer industry? As the mega breweries buy smaller regional craft breweries, and quickly accelerate their growth through expanded geographic distribution, incremental chain retail placements, and increased marketing support, they are bringing their buying power into the craft beer space, and using that purchasing power to secure large quantities of difficult-to-source varieties of hops and potentially other raw materials. If AB InBev can grow these breweries fast enough, they can impact the overall ability for other craft breweries to grow by limiting access to the raw materials market. That’s happening even from larger craft breweries who want to protect their future resources. Buy now, share later. From that perspective, growing these craft brands may not be about a nice long-term steady growth plan for the brands, but rather a quickly executed defensive play to slow the growth of competitive independent craft breweries in the short-term. The big boys are ready to spend, and Indepedent Liquor’s parent company said it’s ready to spend billions on acquisitions. For a quick comparison, revenue of Asahi is 18 Billion dollars. An infinitesimal fraction of that can change the entire drinking landscape of New Zealand, if they thought our market was worth pursuing. In Jim Vorel’s piece, The BS Arguments of Craft Beer Sell-Outs: How Brewery Buyouts Hurt Craft Beer – he gives an an excellent counter-argument to brewery buyouts. These include that expenses reduced competition, cutting support from local communities, and give big breweries the ability to take over more taps and create strangleholds on resources such as hops and malt. Personally – while Outlier Cartel harbours no ill feelings for people who sell, as people have different reasons to sell; financial reasons are as good as any. However, we live in a transparent world, and if you are planning to leave a legacy, your own reputation will soon be swallowed by the reputation of your buyer. Influencing distrubution: Leverage resources also means distribution: AB InBev introduced an incentive to their distributors, where AB InBev would refund 75% of distributors required marketing spend on AB InBev brands (up to $1.5 million) if AB InBev beers make up 98% of that distributors’ sales. Think about that, they are essentially paying distributors incentives to block competition. While it is unclear if Mitisubishi, Asahi or Heineken are influencing the New Zealand, they certainly do not lack any financial backing to do so. In short, if you have money to block your competitors you can do this. Let’s hope this is not happening in New Zealand. That unique voice is often muffled by the sound of millions of bottles and cans being processed in a large brewery. Brewing Magnate forces to apologise for blocking independent brewer from awards. Even if honest mistakes where made – they happen on a grander scale, and it requires much more oversight than smaller breweries. Here in New Zealand – there’s a struggle for smaller players getting representation. There are many excellent, making outstanding beer – but what can you do if dirty tactics big money are used to stymie competition? In New Zealand, the NZ Brewers Guild currently tries to represent all brewers, with 2 chairs going to Mitsubishi/Kirin/Lion and Heineken/DB. Many smaller breweries liken to letting the bully on the playground run the show. Outlier Cartel believes there is room for a completely independent guild, whether it is NZ Brewers Guild or a new entity. In Australia the brewers.org.au represents only Mitsubishi/Kirin/Lion, Coopers and Elders IXL/Carlton & United where as the Independent Brewers Association represent smaller breweries based on output and limited stakeholding from other other representatives. Is Big Beer inherently bad? I’d like to think not, in fact its easy to forget that there people just like you and me who work there. While its easy to point negatives, big beer can offer some creative solutions to local communities. One of my favourite’s is SABMiller’s promotion Cassava production for local African farmers to create a local and sustainable economies. Sadly, it doesn’t take long to dig through and find found that SABMiller was using African and Indian as tax havens. Like anything – ‘craft’ is hard to define, some might even say that gypsy brewers like us are not independent as we are dependent on other peoples brewing equipment. Others have pointed out that the Brewers Association of craft leaves some loopholes for big breweries to labelled as craft. In short, it gives us choice. Beer goes to our bodies, those bodies are our living temples. As modern consumers, we can go beyond just taste, we can make informed decisions about who to support and who not. Unfortunately, big beer has a lousy track record track record of behaving in line with anything other than self interest. Currently New Zealand has a lot of choice, but that choice hangs in the balance if big beer exerts continues to operate in accordance to their historical precedence.